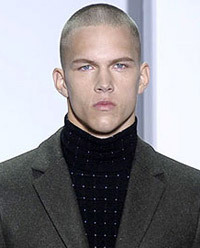 Dmitriy Tanner was born in Russian Federation, in 1990, was an American Marine and male model. He was born in town outside of Moscow and at the age of 12 was adopted by an American couple. He was discovered in a shopping mall, by model scout from modeling agency Soul Artist Management. Dmitriy began his modeling career in 2011. He made his catwalk debut for Givenchy show in Paris. He was a marine with the USMC. Tanner died in a car accident on Saturday 28 September 2013. Apollo Magazine, Test Shoot Dmitriy Tanner by Miguel Starcevich, Fashion For Men, Essential Homme, GQ Style Germany, WWD, V Man, i-D Magazine, Arena Homme +, L'Officiel Hommes, Portrait. Walked runway for Calvin Klein, Versace and Givenchy. They joke that they have to roll out a red carpet for me. My higher - up officers are impressed and tell me this is great for me. But they tell me not to get affected by it and [let it] make me become a bad Marine. They don't want it to go to my head. I wanted to pay my dues to my parents — and respect to the country — that gave me this life. When they had to bleach my hair and dye my eyebrows, it was a little weird.